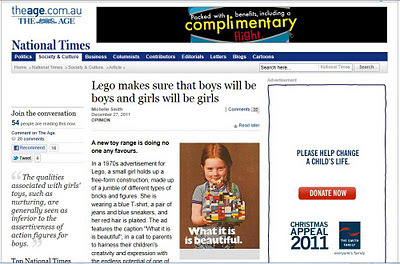 I have an opinion piece in today's Age newspaper on the new Lego 'Friends' range for girls, which was produced in order to attract girls to the Lego brand. Understandably, there is some debate on the issue in the comments already. Authors do not choose article titles in newspapers, so this would not have been my choice for a headline, but they are written to invite readers in with a bit of controversy. I guess the point of the article is that what we think girls and boys are is really a bit of a fiction. Maybe a little girl is the best authority on the subject. And this girl's toy store complaints sum it up quite simply. Lego has changed dramatically over the years. Very few kids get given a straight up tub of Lego and are therefore able to use their imagination when building. Instead it's all about these 'kits' to build a specific item with instructions to follow. This is probably part of the reason why the gender differentiation is flourishing as marketers try to target these kits to what they perceive the market as being. 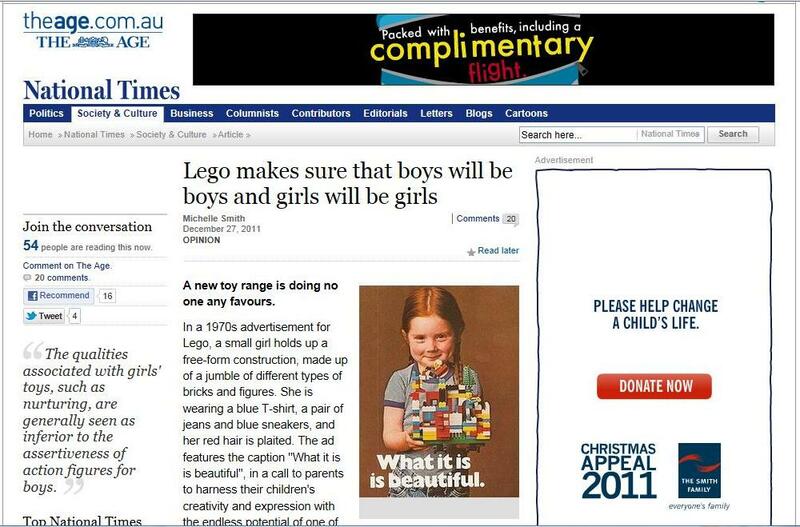 Modern Lego - for unimaginative gender bound kids (good work modern parents! ).